Experience Red Roof PLUS+. Adding more WOW to your stay! Discover an enhanced experience with all new rooms and our most requested higher-end amenities. A completely remodeled and upgraded stay. Red Roof PLUS+ San Antonio Downtown - Rverwalk is a pet friendly, family friendly hotel. This hotel is close to The Alamo, San Antonio Convention Center, the Riverwalk, the Alamodome and River Center Mall in downtown San Antonio, TX. The hotel is also close to Lila Cockrell Theatre, Market Square, Freeman Coliseum, AT&T Center and Splashtown. When you check into the Red Roof Inn San Antonio Downtown - Riverwalk, check out the fantastic new amenities in our NextGen design rooms that are 100% smoke free and feature a stylish, boutique design with all new furniture, spa-inspired bathrooms with modern vessels sinks, new comfy Rest Suite beds by Serta, plush high-end bedding, modern design flooring, new seating and a large, flat screen TV. 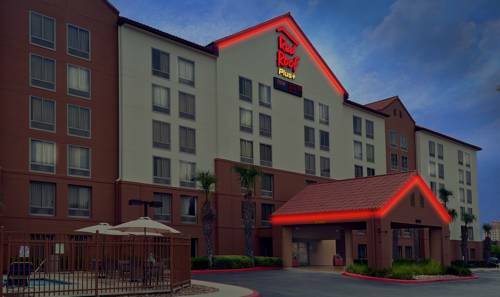 This Red Roof PLUS+ hotel also features Premium Rooms with a snack ready in your room! We feature a conference room, free local and domestic long distance calling, ATM, an outdoor pool, elevators, interior corridors with WiFi available throughout the property. Selected rooms offer microwave and refrigerator units (a nominal fee may apply; please inquire). Now offering Red Roof's new "Order Inn" program, where guests can order delicious food for in-room delivery.Experience our complimentary coffee and tea in the lobby. We offer On Command Video with a selection of free TV channels, pay-to-view premium channels, movies, music and games. Please contact the inn for more details. One, well-behaved family pet per room is welcome. Experience Red Roof PLUS. Adding more WOW to your stay! Discover an enhanced experience with all new rooms and our most requested higher-end amenities. A completely remodeled and upgraded stay. Red Roof PLUS+ San Antonio Downtown - Rverwalk is a pet friendly, family friendly hotel. This hotel is close to The Alamo, San Antonio Convention Center, the Riverwalk, the Alamodome and River Center Mall in downtown San Antonio, TX. The hotel is also close to Lila Cockrell Theatre, Market Square, Freeman Coliseum, ATT Center and Splashtown..